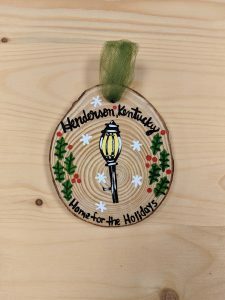 Henderson Tourist Commission – What’s New at Henderson’s Official Gift Shop? 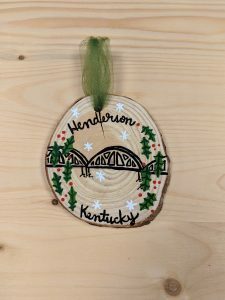 Henderson Tourist Commission / apparel / What’s New at Henderson’s Official Gift Shop? You don’t have to be a tourist to shop our souvenirs and gifts. 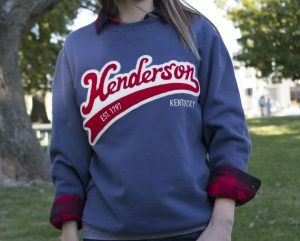 Henderson’s official Welcome Center has cool Henderson gear that makes for great gift ideas. 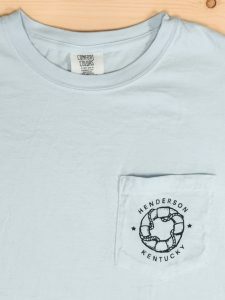 Our super soft Henderson shirts are designed in Henderson by a Henderson native, which makes our gear authentic and unique. If you have never made a visit to see our gift shop, take a look at what is new this month! Find out about how to save money by shopping our MERRYMONDAY Sale by reading below! 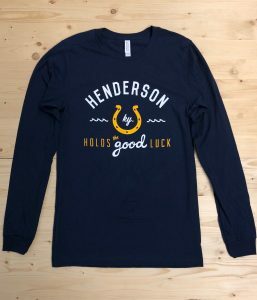 Where does the saying “Henderson holds the good luck,” come from? Legend says that a horseshoe that is displayed with the heels up is sure to collect good luck. 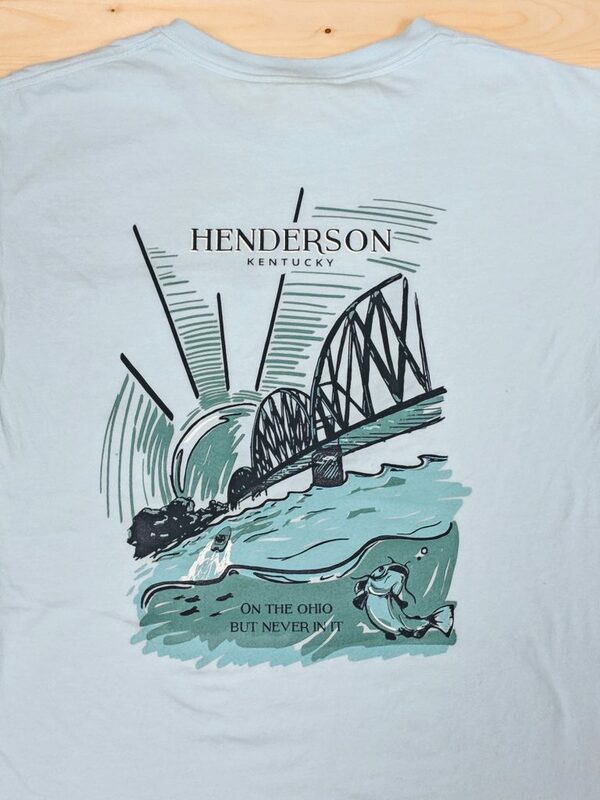 Naturally Henderson, the city that sits on the Ohio River’s horseshoe bend, is full of good luck. Want to test your luck? Just ask our hoofed friends at Ellis Park. A $2 bet on a fast thoroughbred could go a long way! This shirt is great for horse racing fans, Henderson lovers, or even those friends that are crazy about Saint Patrick’s Day! This super soft long-sleeve tee debuted in our shop on Small Business Saturday and is just $25. Check our website to see if we have the “Lucky Long-sleeve” tee in your size! 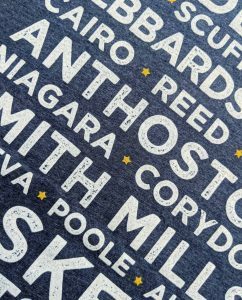 Our newest rendition of the “On the Ohio, but never in it,” tee is here! We splurged for a super soft and durable Comfort Colors tee with a chest pocket on the front and full color design on the back. 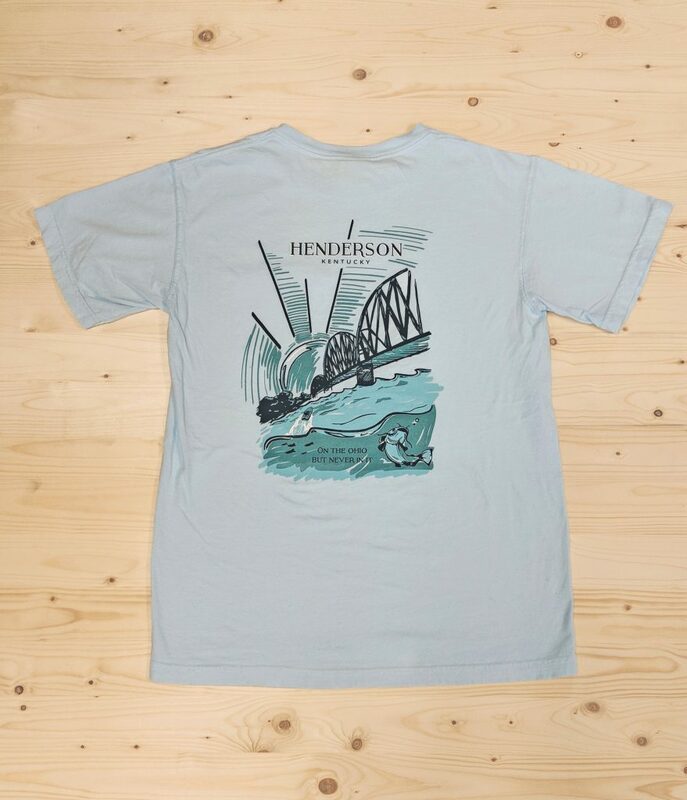 Designed in Henderson by a Henderson native, this shirt is perfect for any avid boater or water enthusiast. Regardless of the river’s beauty, some locals claim they wear the shirt because of the cheeky coincidence that they’ve never stepped foot in the Ohio River. 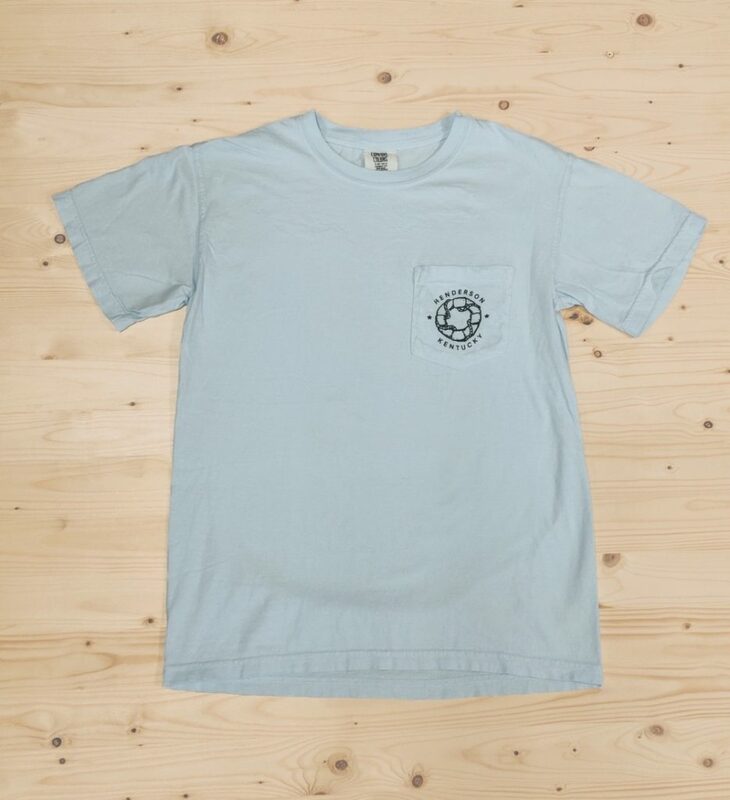 This “chambray” Comfort Colors pocket shirt with front and back full color designs is $28. Check to see if we have the “On the Ohio” tee your size! 3. We ❤ Henderson Townships! Say hello to the hottest selling t-shirt in our shop! 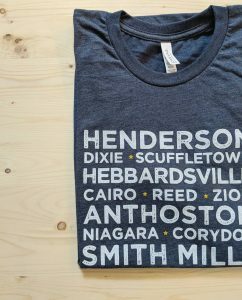 After our much loved blog series featuring the country stores of Henderson, we introduced our Townships Tee in fall of 2018. Turns out everyone loves all of Henderson County’s little townships as much as we do, because were sold out in just a couple weeks! Now they are back in stock and ready to be placed under your tree. 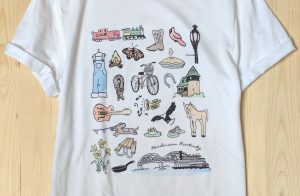 This shirt is great for all the moms and pops and good ol’ country folk that love their hometown! This super soft tee has unisex fit that is true to size. Get yours for $25. Check to see if we have the “Townships Tee” in your size! Looking to splurge on someone special this year? Our classic crewneck is just as cozy as it is stylish. This vintage inspired piece has top quality embroidered features. The detailed appliqué has the look and spirit of a letterman’s jacket. This Port & Company brand sweatshirt is warm and runs slightly larger than our typical Canvas brand crewnecks. This piece was designed for young and old alike, and will be a staple in anyone’s wardrobe for years. Introduced in 2017, this item is still relatively new to our gift shop. Add this classic piece to your wardrobe for $60. We recently re-stocked all sizes this December just in time for Christmas! Check now to see if your size is available in the Classic Crewneck. To take the best care of your classic crewneck, we suggest washing inside out on the gentle cycle and laying flat to dry. 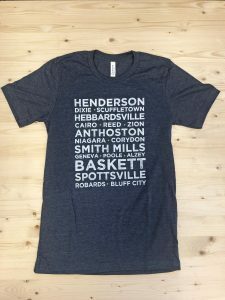 Among our awesome selection of Henderson, Kentucky tees, we also carry a variety of Kentucky for Kentucky t-shirts. Our Kentucky selection varies from season to season. All of these trendy Kentucky pieces are 20% off during our MERRYMONDAY sale along with the rest of our merchandise. But you must grab these in-store as they are not available online through our store. 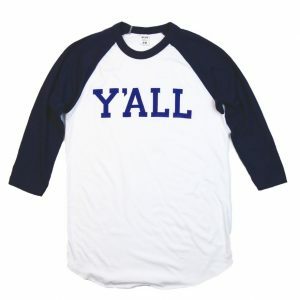 Three quarter length “Y’all” raglan baseball tee, $30. 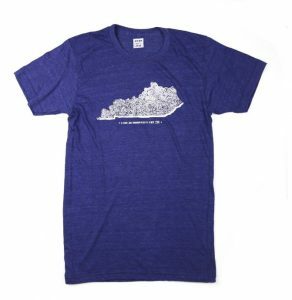 The popular short sleeve blue “Kentucky Counties” tee features every county in Kentucky! $25. 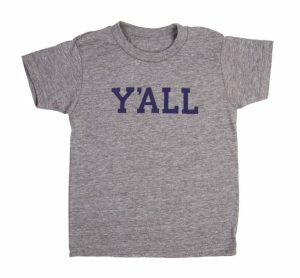 Get the basic grey y’all short sleeve, for $25, for any southerner! 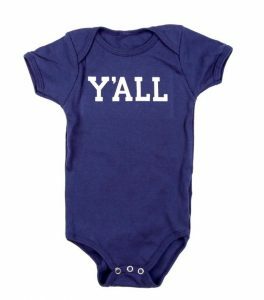 For the little ones, this navy blue y’all onesie is available in both newborn and 12 month sizes for $20. Also (not pictured) the “Heaven is a Kentucky Kind of Place” short sleeve tee in grey, and the new “Bourbon and Bonfires” tee in blue available now! Chugga-chugga choo-choo! 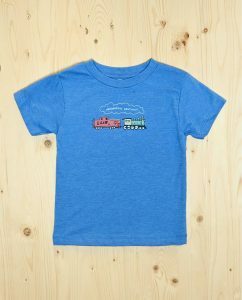 This toddler tee is brand new too! Don’t forget to shop for the tiny people on your list. 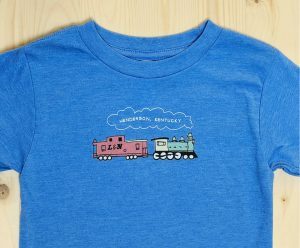 This blue toddler size tee (2T-4T) is a great gift for new or expecting moms. With the primary colors in the design, this shirt is great for both boys and girls. Not only is it super soft like the rest of our shirts, the hidden meaning behind this shirt is in the details. The L&N on the train caboose stands for L&N Railroad (Louisville & Nashville) and it was a very active railroad that ran through Henderson. 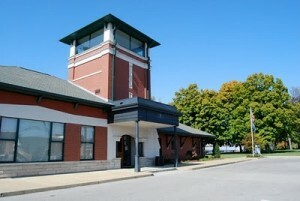 Kids can even see a life size L&N caboose outdoors at the Depot Welcome Center. Here is another fun fact: you can match with your tot too! Our feminine tunic tee that we designed with Torunn Lee has the same train design! For $18 and $30, these two shirts make a great mom-daughter combo gift. Check to see if we have your sizes available! We have a hard time keeping these new ornaments on the tree! 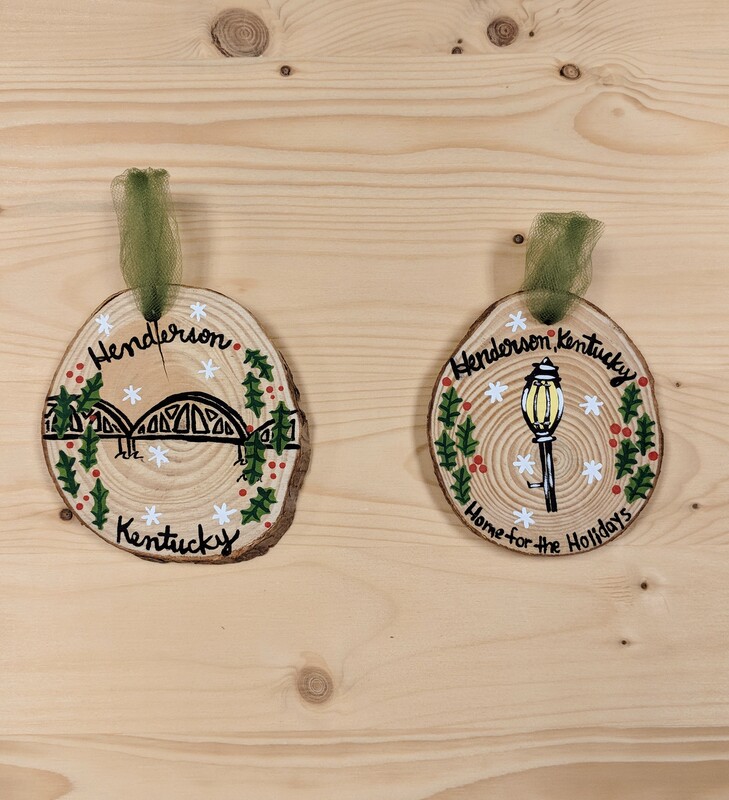 Hand-painted by local artist, Kaylynn Poole, these wood-slice ornaments feature two Henderson winter scenes. These custom design ornaments are acrylic paint on natural wood with a fabric ribbon attached. Choose between the railroad bridge or the classic Main Street lamp post for just $15 each, or get both during our MERRYMONDAY Sale! We updated our ornament stock on December 4! Shop for ornaments at this link. Our gift shop has great knick-knacks and gadgets that make great stocking stuffers. 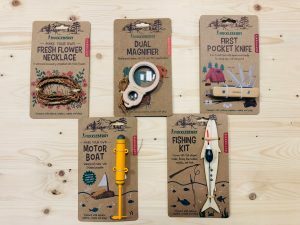 Teach your kids to create by gifting a fishing pole kit or motor boat kit. 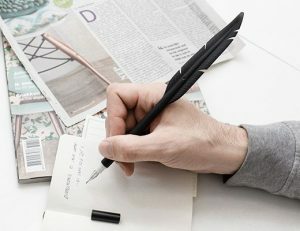 Write inspiring notes with our feather pens which are now back in stock! We also have cool accessories like the popular Southern Socks (they don’t last long!) and a variety of quality Henderson drinkware items that are great for the home or office. Candles make a great gift for anyone, and we made a custom Henderson scent that includes lavender, sandalwood, bergamot, cedar, patchouli, moss, and clove. There are only two more Mondays left to get these gifts on sale! Do not forget to shop during our MERRYMONDAY Sale on December 10 & 17! 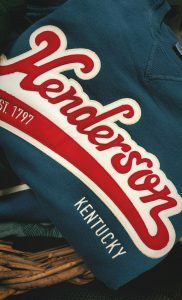 Get 20% off all Henderson products, Kentucky for Kentucky apparel, and accessories during our MERRYMONDAY Sale! We will extend our gift shop hours from 9 a.m. to 6 p.m. on these two days. If you are not able to shop in person, you can still get 20% off by using promo code MERRYMONDAY on our online store. Visit our online gift shop to browse all of our Henderson goods. If you will be shipping your gifts, please make online purchases by December 14 if you would like to receive them before Christmas. Shoppers can also save on shipping by opting to pickup their gifts at our Welcome Center. Returned items can be exchanged or returned for equal store credit on a gift card as long as a receipt is presented and goods are undamaged and unworn. We hope you are able to support local businesses by shopping small with us this season. The last day to make a purchase with us before Christmas is Friday, December 21! Tuesdays-Fridays: 9 a.m. – 5 p.m.
Open December 26-28 from 10 a.m. – 2 p.m.
Shop 24/7 on our online gift shop!